Chloride plays a variety of important physiological roles in the cells. Chloride channels are responsible for cell membrane potential and regulating cell volume. The chloride level in neurons is related to the actions of neurotransmitters glycine and GABA . The chloride level in blood is directly related to the kidney functions. Chlorides are the most common reagents and buffers used in research and the most abundant anion in nature. 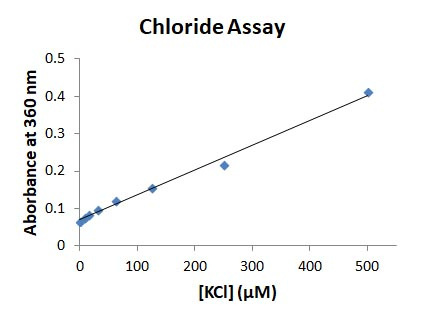 The MicroMolar Chloride Assay Kit (Catalog number CLA100) provides a quick and simple method for quantification of chloride in a variety of samples. The kit does not contain toxic mercury component. It is based on measurement of optical density at 360 nm (OD360) that correlates the chloride concentration in the presence of Reagent CLA. The assay linear range is 0.01 mM – 1 mM. Samples with higher chloride concentrations are diluted. The assay is compatible with a HEPES buffer. It is not compatible with EDAT or thiol compounds such as DTT, 2-mercaptoethanol or cysteine. The MicroMolar Chloride Assay Kit (catalog number CLA100) includes 3 ml of Reagent CLA and 0.1 ml of 10 mM NaCl solution. It is for measurement of 100 samples using 96-well plates. Cuvettes may also be used for measurements.